William Edwards was registered as an Absent Voter in Bottesford, 1918/19, whose address was given as the West End, Bottesford. William Edwards was born in Bottesford on the 30th August, 1898, the son of Betsy and William Edwards. Betsy had been widowed and had remarried. Her first marriage had been to William Barrand, who had died in 1895, leaving an estate of £60.18s. Betsy and William had five sons – Ernest (1882), Walter (1884), Cyril (1889), Fred (1882) and Leonard (1884) and two daughters, Edith (1881, not mentioned in later censuses and may have died young) and Lily (1887). Her second marriage, in 1897, was to William Edwards, born in 1845, who, according to the 1891 census, had a tailors and drapery business on Queen Street. William’s first wife was Amy (b.1843), and they had had four children, of whom the two youngest, Robert and Amy, b.1887 (probably twins), may not have survived childhood. In 1901, William and Betsy Edwards lived at 6 High Street with their son William, born in 1899, daughter Ada (b.1900), stepsons Cyril, Fred and Leonard and stepdaughter Lily. Sadly, William Edwards Senior died soon after the census, in August, 1901. In 1911, William Edwards was at school and still living on the High Street with Cyril, Fred and Leonard as well as his mother Betsy and sister Ada. At this time, Cyril was a butcher’s assistant, Fred a baker’s assistant and Leonard a gardener’s assistant, while William and Ada were at school. William started work with the London & Northeastern Railway (LNER) on the 8th March, 1915, age sixteen. He would not have been old enough to join the forces until 1917 (unless he joined under-age). 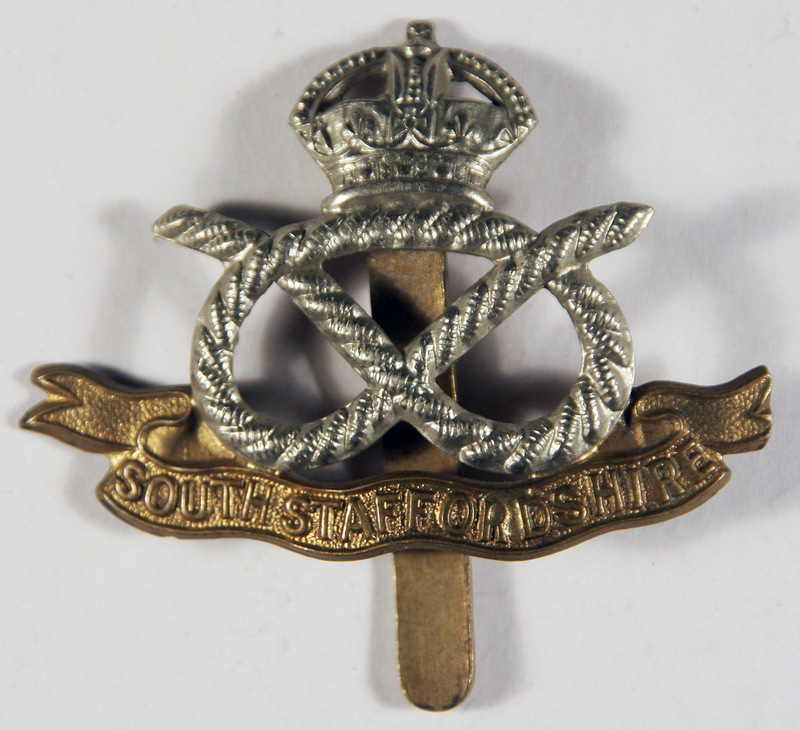 As stated in the Absentee Voters list, William Edwards served as Private 37245, 46th South Staffs Regiment. There is some uncertainty as to which army unit this refers to. There does not appear to have been a 46th Battalion in the South Staffordshire Regiment ( The Long Long Trail). It may refer to the 46th Division of the Territorial Army, which was in France during 1917-18. Alternatively, it may refer to part of the 6th Battalion, South Staffs, who fought in Egypt and later in France. In either case, William Edwards’ service was probably in France during the later parts of WW1. The Electoral Rolls indicate that William Edwards was living with his mother, Betsy, in the Spring of 1921, and then on his own by the Autumn of 1925, suggesting that Betsy Edwards had died by this time. LNER records state that in 1939 he was working on the railway as a lampman, earning £2.6s per week. He died in June 1966, aged 67. Service records are very limited. The information shown here is taken entirely from the list of Absentee Voters (as submitted by his next of kin, in Bottesford) and genealogical searches.